FC Barcelona’s arrival in New York has generated a huge global impact. The opening of its new office in Manhattan and the club’s interest in expanding into the American market has not only attracted spectacular interest in the US, but has also been widely reported in the media of China, Japan, India, the whole of Europe and Latin America. The story has appeared in newspapers, on TV and radio stations and on hundreds of websites. Such media as CNN (in English and Spanish), Bloomberg, ESPN, Fox, Fox Radio, Bein Sport, Associated Press, Yahoo!, Fast Company, The New York Times, ABC News, San Francisco Chronicle, Los Angeles Times, NBC, Newsday, The Washington Times, Telemundo and the Bleacher Report have been covering the story of Barça’s arrival in America. 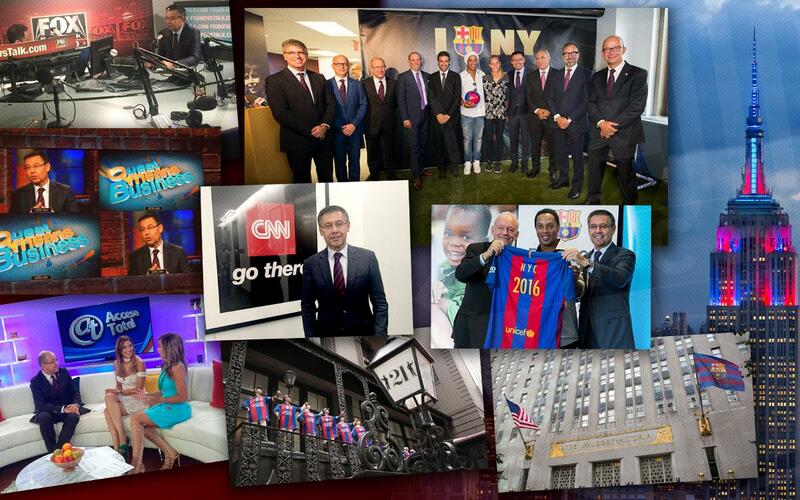 The most repeated headline was ‘Barcelona Arrives in New York Looking to Expand US Market’. Ricardo Zúñiga of the Associated Press wrote in an article that was reproduced in ninety-six North American papers that: "In an effort to take over the U.S. market, the Spanish soccer powerhouse is showing that it's also a global, multimillion dollar business." The prestigious Fast Company ran with the headline: "FC Barcelona Gets Serious About American Brand Outreach With New Manhattan HQ", Bloomberg repeated in its news bulletins the comments made by president Josep Maria Bartomeu to the network’s star analyst, Jonathan Ferro, while CNN did likewise with what the Barça premier had to say on its most watched financial show, Quest Means Business. All day long, ESPN and Fox repeatedly screened pictures of the events taking place in Manhattan and the Bronx. This weekend CNN in Spanish has announced that it will be showing a special program about Barça on the 12th, when the United States celebrates Hispanic Day. The statements by Bartomeu, and by vice-presidents Manel Arroyo, Jordi Cardoner and Jordi Mestre, as well as the director of the New York office, Arno Trabesinger, and the club’s commercial director, Francesco Calvo, not to mention the coverage of the events in New York, generated major exposure, according to a media impact analysis, on almost 150 media websites around the world, many of which have audiences in the millions. The moments most highlighted by the media were the image of the Barça flag on the façade of the Waldorf Astoria, the presence of Brazilian superstar Ronaldinho in the Bronx, the jockeys outside the 21 Club dressed in the Barça colours, Ronaldinho scoring a goal to inaugurate the office, the presence of top model Adriana Lima at the reception afterwards, the UNICEF event at the United Nations and, of course, the lighting up of the Empire State Building in the club colours. The 'Barça Loves New York' video has received thousands of visits on YouTube. The news also had a staggering impact on social networks. The club’s official Twitter account, with the hashtag #FCBlovesNY, the information about the opening of the office and the FC Barcelona themed events going on in parallel over two days in New York generated 57 million impressions. Meanwhile, FC Barcelona’s Facebook page obtained a total of 31.5 million impressions. Over the course of these two days of intense Barça activity, the news coming out of the Big Apple generated stories all around the clock. On Facebook, the news was complemented by further information in the form of photo galleries, videos and all the top stories.